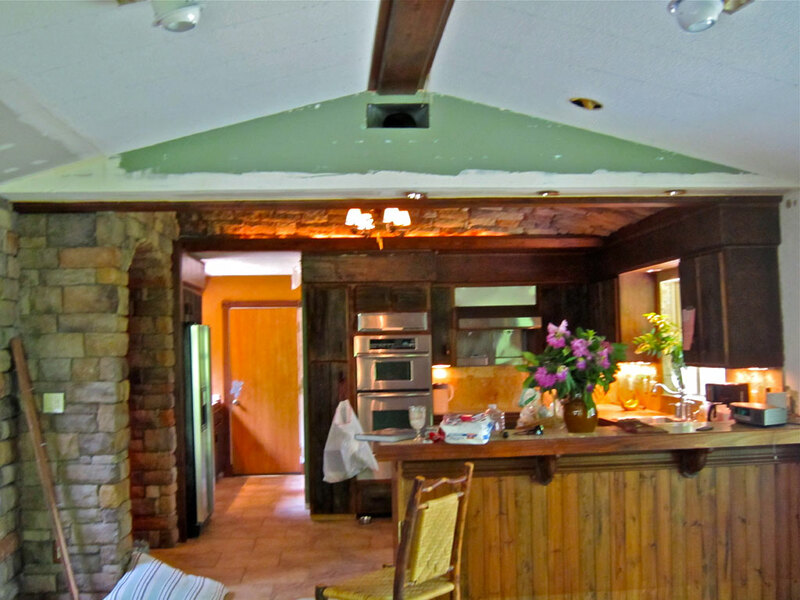 here was no Faux Boise here, honey–just fake wood on the ceilings–all of them! 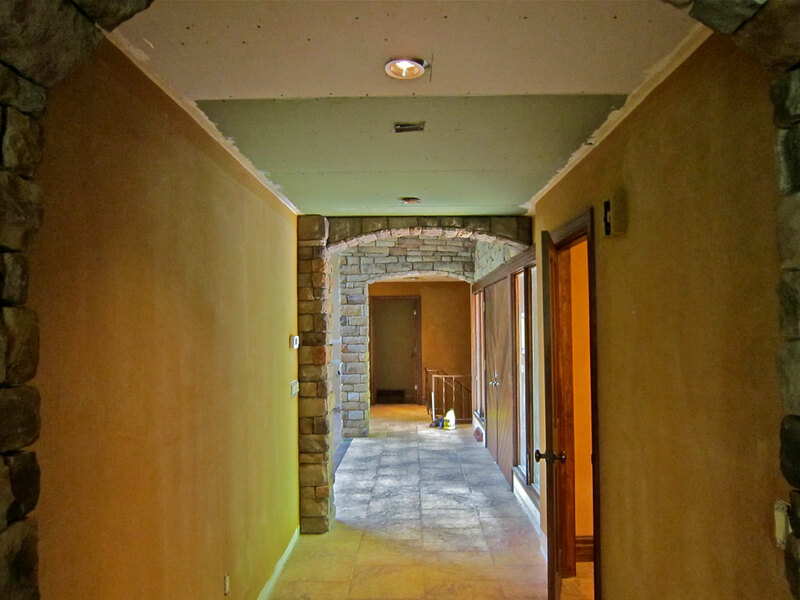 I am proud to post this update announcing that all of the ‘fake’ ceilings are gone! A big hug and thank you to my college son for ripping them all out … love that boy. A picture is worth a thousand words–or boards, as the case may be. 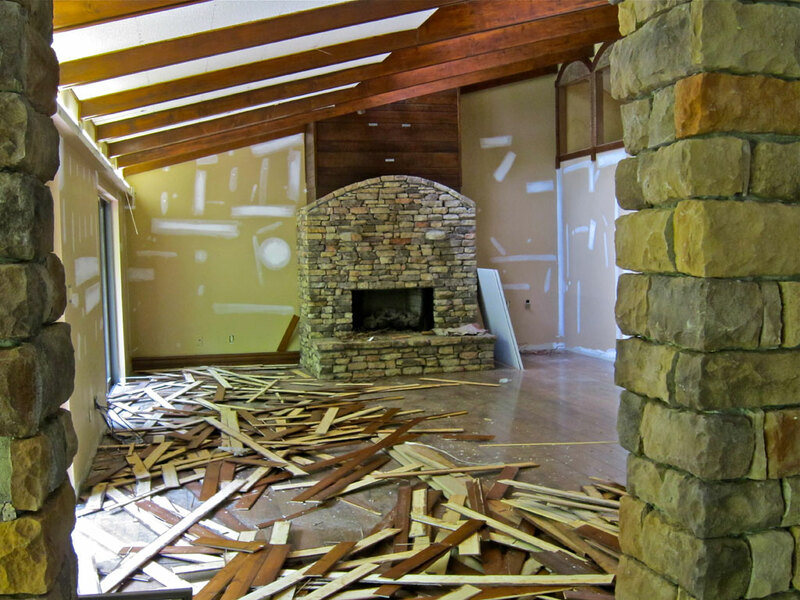 All of the boards are down–fake stone removal is for round two. Beauty is hard work–I was the chief wood remover and floor cleaner. I need more help. Totally clean ceiling. I did not know we had an arch in the ceiling–is that 80’s green? 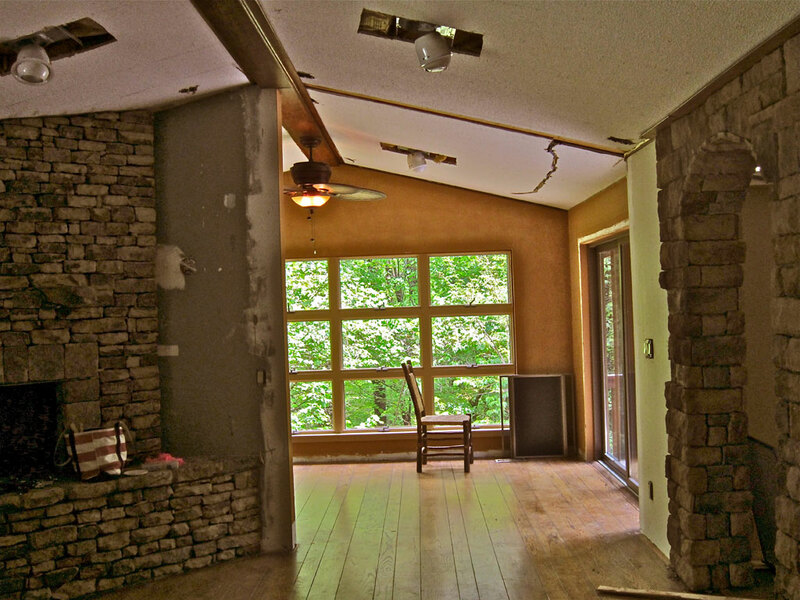 View into the Sun Room–notice the ‘s’ carved for wiring in the ceiling. All of the can lights are leaving and lanterns will hang from the center beam. 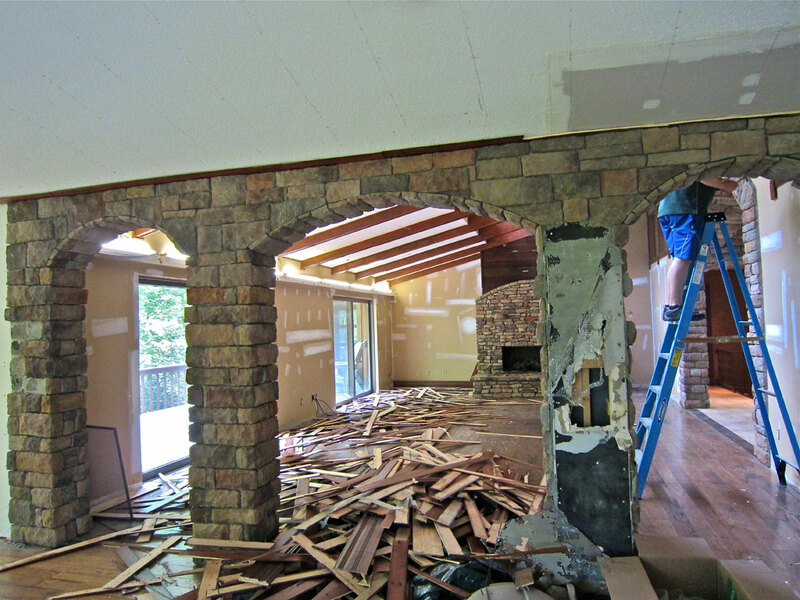 The stone on the fireplace is real, but the fireplace is not–so strange! 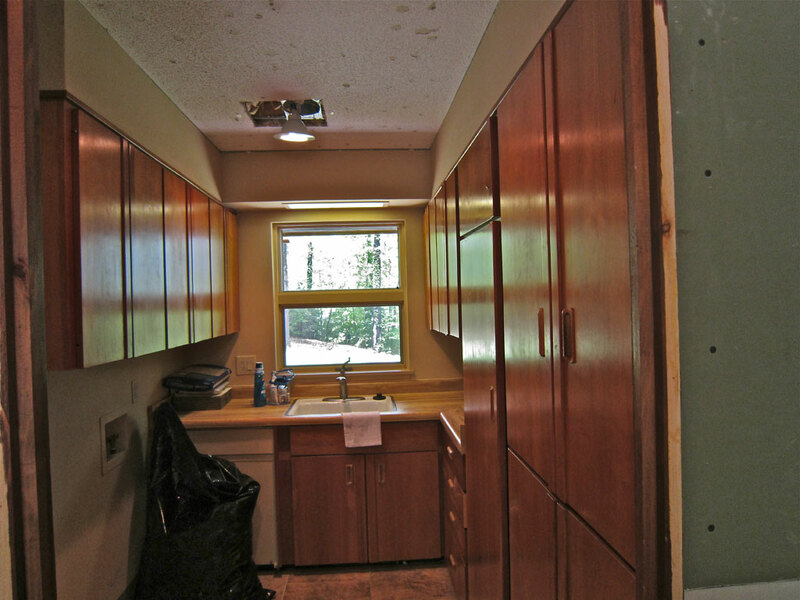 This laundry room will be opened up and a Dutch door installed into the kitchen. I love a Dutch door–so friendly! The back entry into the Mountain house will open up soon. Entry will be on the right–laundry on the left. 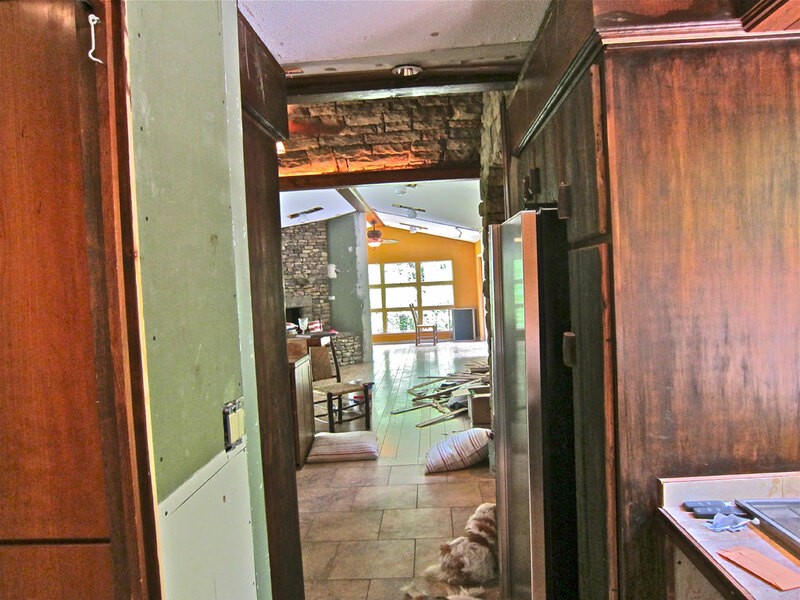 The kitchen is straight ahead to the left. The Front entry looks much better without the fake ceiling. We will also be adding a new front door and a beautiful round window … more later. Did I mention that we had a broken pipe last night and lost a ceiling? Oh Well… I am back in Atlanta for a day or two, but will be back at work in North Carolina soon. Lissy this is all very exciting. I can’t wait for the next! Thank you Frances! Much, much more work to follow. I love having a strong helper home from school. I will post the view really soon. I am glad Virginia loved it. I love seeing the progress; keep posting!! I may have missed something, but are you moving there permanently? In my dreams … I hope to be there soon. Can’t wait for more progress reports! It is so exciting! Everything just keeps looking better! I am having the most fun with this house–thank you for all the encouragement! Lissy, Your blog gets better and better! Have missed reading it while I was gone! Happy to be getting back to normal. Thank you Marilyn–missed you while you were in NYC. I love interior design :: beautiful gardens :: antiques :: cooking :: dogs :: renovations :: and bargains. Located in Atlanta, Georgia and Highlands/Cashiers, North Carolina … and wherever my travels take me. Check out my Favorites on the List Pages—updated with places and things I love. Read my blog for my latest finds. I’m a visual person so I won’t bore you with lots of text. Let’s go!